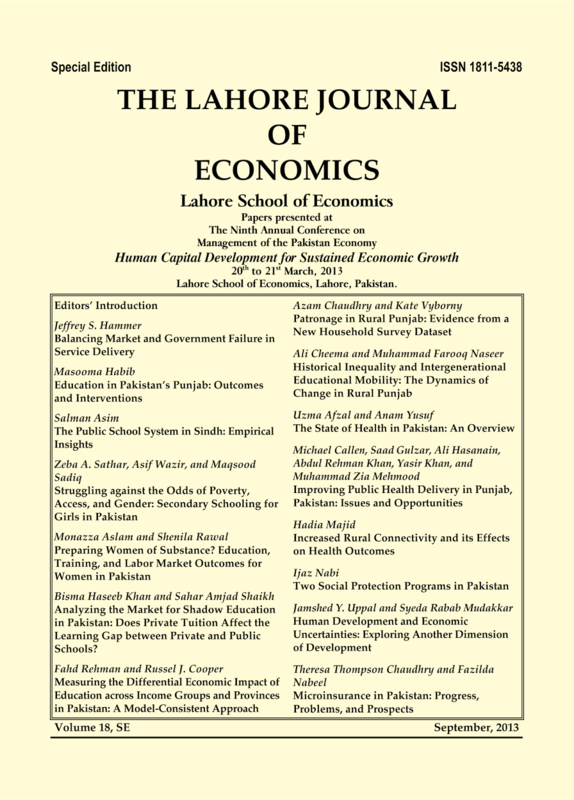 The Lahore School’s Ninth Annual Conference on Management of the Pakistan Economy took place on 20 – 21 March, 2013 and the topic of this year’s conference was: “Human Capital Development for Sustained Economic Growth”. 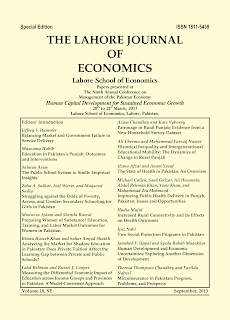 The conference participants ranged from leading economists and researchers in Pakistan, India, Sri Lanka, the United Kingdom, and the United States to leading Pakistani policy makers and NGO representatives. Over the course of two days, 14 research paper presentations were made on topics related to public service delivery, with a special emphasis on the education and health sectors as well and human development and social safety nets. The keynote address was given by Jeffrey Hammer who spoke on governance and service delivery. The speaker outlined how market limitations in service delivery can be matched by appropriate government interventions, though the level of intervention has to be based on a careful analysis of the limitations of each sector as well as country circumstances. This paper outlines how limitations of the market can be matched to appropriate interventions by government as it actually performs, not as it is hoped to perform. This matching will, by necessity, vary with country circumstances. 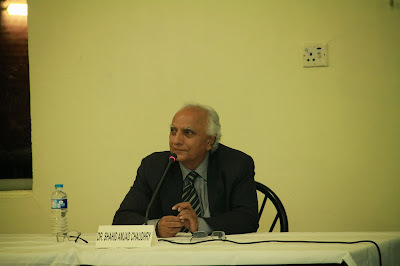 Mr. Manzar Bashir, a renowned psychometrician and Certified Master Practitioner of Myers-Briggs Type Indicator (MBTI) test in Pakistan, was invited to the Lahore School of Economics on September 14, 2013 as a guest speaker to share his insights and expertise on the subject of personalities and the MBTI test with the students. Mr. Bashir who is also a CIPD UK graduate, started with the introduction and historical background of the MBTI test, as well as all the sixteen types of personalities it can successfully decipher. After covering the basics of the test and enlightening students about the personality traits of some very famous celebrities, the guest conducted a class activity based on the personality traits that each student thought he or she possessed. Students also had the opportunity to ask questions from the guest speaker and learned about the various facets of human personality. 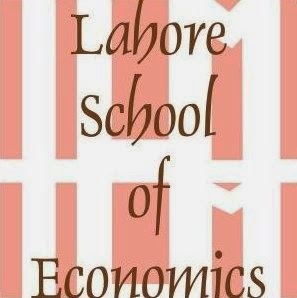 At the end of the session, Mr. Bashir was presented with a souvenir of The Lahore School of Economics. Mr. Adeel Anwar Director OD and Training Warid Telecom was invited as the main speaker along with Ms. Amna Faisal (Lahore School) graduate who is also currently working for Warid. The topic of the day was “Selection Coaching for business Graduates.” Mr. Adeel gave tips to students on how to answer interview questions, the main technique of which was the “STAR” approach. He then spoke about the necessary “soft skills” and “hard skills” that a candidate should possess. Another important advice he gave to the students was to conduct “PEST” analysis of the company that they were applying to. The speakers also mentioned the necessary behaviors organizations look for in a successful candidate, which included traits like passion for growth, collaborative working, integrity, ownership, planning and organization, decision making power, delegation, time management and communication skills. Kenan A. Siddiqui Regional HR Head HBL delivered a lecture on Interview Skills, Resume writing and grooming to the students of MBA II. Mr. Kenan gave a brief introduction of HBL and different banking areas. He discussed in detail the hiring process practiced by HBL as well as different banks and firms throughout the country. He then spoke about different techniques of resume writing, the roles and career paths graduates could follow and important skills required for certain jobs. The speaker also told the class that the Lahore School students are privileged to be exempted from the entry test as the degree holds a very good reputation and credibility in the market. The last segment of the lecture was based on interview skills required, the makes and breaks of an interview and some important tips on how the candidate should dress up for an interview and what the interviewer expects from the candidate. To help Lahore School Alumni improve professional skills, further job prospects and enhance networking, the School has formed specialized alumni associations (Lahore School Specialized Alumni Association of Independent, Business Leaders, Bankers and Financial Analysts, Professionals in Corporate Sector, Educationists and Public Officers, Telecom and IT Specialists and Consultants, Trade Specialists and Alumni Association of Advertising and Media Professionals). Alumni Office in the School has appointed seven secretaries to Alumni Associations from the current graduating batch. Seven faculty members have also been appointed as patrons to these associations top help Alumni in case they want any assistance in their respective fields.